Designed by the Greek architect Yussuf Bushnaq, The Mohammad Ali (Alabaster) Mosque in the Citadel was begun in 1830 (finished in 1857) in the Ottoman style by Mohammad Ali Pasha, ruler of Egypt, and founder of the country's last dynasty of Khedives and Kings. 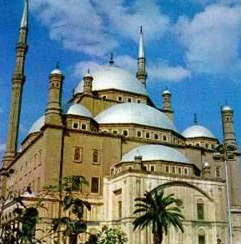 The mosque is the Tomb of Mohammad Ali and is also known as the Alabaster Mosque because of the extensive use of this fine material from Beni Suef. Its two slender 270 foot minarets are unusual for Cairo. From the arcaded courtyard, visitors have a magnificent view across the city to the pyramids in Giza. 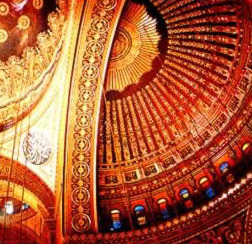 Just off the courtyard is the vast prayer hall with an Ottoman style dome which is 170 feet above. The parapet to the southwest offers a good view of the Sultan Hassan and Ibn Tulun Mosques and of Cairo itself. Perhaps because of its location, it is one of the most frequented Mosques by tourists.